The auto-patcher appears when a new update is available on the patch server. Note, this guide shows the Windows version of Trainz. The steps will be very similar, or the same, for the Mac version. You can also manually trigger the update by clicking Launcher > Trainz Settings > Install > “Check for T:ANE Updates”. You will then be notified if a patch is available or not. Simply click OK to begin the process which involves downloading the small T:ANE Patcher program. Once the Trainz Patcher is downloaded, you may see a request to provide permission for the patcher to access your computer. Once you click yes, the updating process begins and you can follow progress in the window as shown below. Patching from xxxxx to xxxxx… Again the progress bar will appear (after a minute or so preparation). This time this step takes depends on your hardware and could take from a few minutes to an hour or so. Updating Trainz asset database… This step is the final stage and may take several minutes. 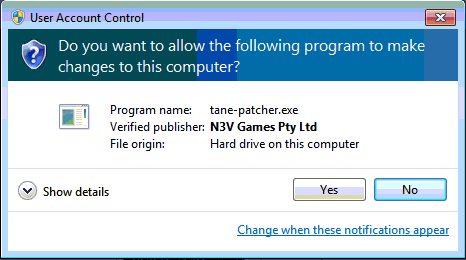 If prompted, allow T:ANE Patcher.exe to make changes to your computer. If you DO NOT receive the Patch Complete message, your update has failed and you are likely to have problems. We suggest that you reinstall the game and begin the process again. For Mac, if you see a screen showing "Ready to Begin" with no option to continue, then please download and install the online patch installer for TANE. If you cancel the patch for any reason, you should see an error similar to the one below. If you don’t, your patch may not have ended correctly and data may be lost. We suggest that once you start patching you allow it to finish. If you receive an error such as the one below, it is likely that your install is corrupt. You will either need to reinstall your original version and reapply the patch, or access the latest full install version and install that directly.